¶ Honing a cylinder can go from mild to wild. If the cylinder is within specification and you are only going to put in a new set of rings, you must hone the cylinder to break the glaze. This will put a nice crosshatch pattern in the cylinder walls. The crosshatch pattern will hold oil and help lubricate the piston and rings as the rings wear in to the cylinder. That is mild. A cylinder hone can also be used to bore a cylinder to a bigger size and that is wild. Well... yeah, your right. I need to get a life if I think that is wild! 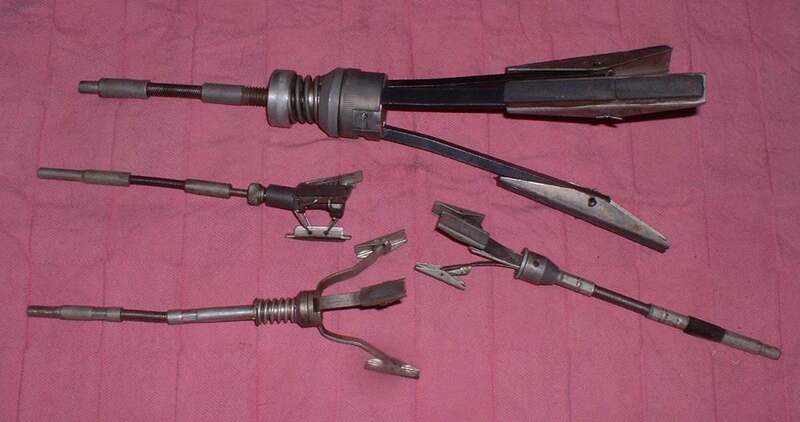 Cylinder hones can also be used to hone brake cylinders, clutch cylinders and most any round cylinder. 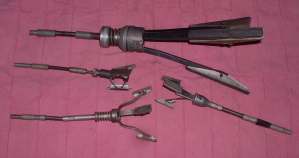 Cylinder hones can be fairly cheap in price, around five dollars, or quite expensive. Ammco and Sunnen hones can cost hundreds of dollars. The cheap ones work well for cleaning up a spot of rust or breaking the glaze. The expensive ones can accurately bore a cylinder to accept the next oversize piston or bigger. To Hone a cylinder is easy. Just stick the hone in the cylinder, slobber on some oil and have at it. Move the hone back and forth in the cylinder to produce a 45 degree cross hatch pattern and in a minute or so your done. That is assuming you don't need to bore it oversize. If the cylinder is well worn you will have to bore it oversize. 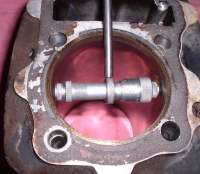 In a cylinder that is grossly worn out, the piston, set at top-dead-center, will wiggle forward and back in the bore. This tells us two things. One, you need to bore the cylinder oversize and two, you are sadly lacking in your maintenance. If the piston is fairly tight you might be able to get away with just a hone job and a set of new rings. If you are unsure you will need to measure the piston clearance. 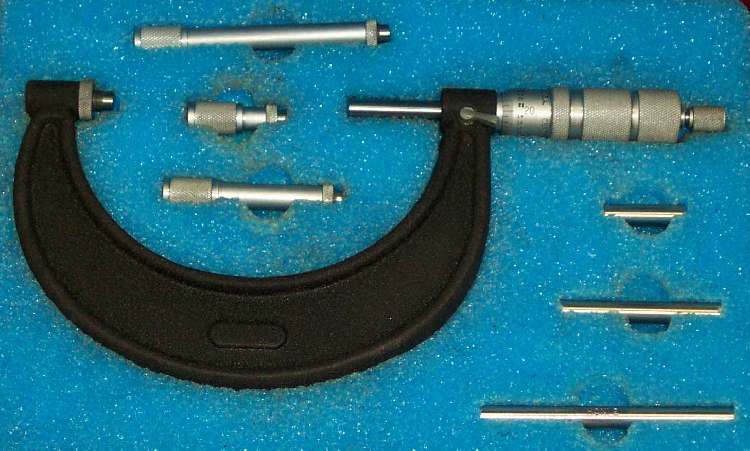 You will need inside and outside micrometers to accurately make the measurements. The procedure is simple but you must be very precise in it's execution. Measure the diameter of the piston about one half inch up the skirt. Both front to back and side to side. Measured at top, middle and bottom of the cylinder. Take the piston measurement and subtract it from the biggest cylinder measurement. 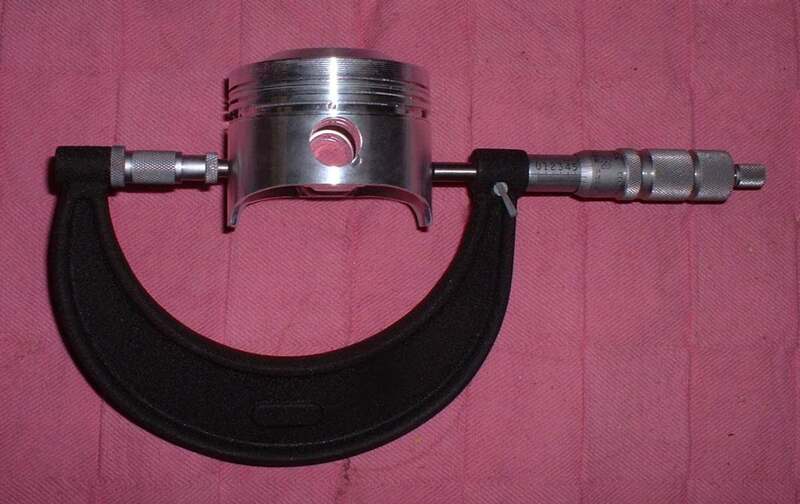 Compare the result with the piston clearance given by the manufacturer of the piston. In other words if the cylinder measures 2.6114" and you subtract the pistons diameter of 2.609" you get .0024". Compare that to the piston manufacturers suggested minimum/maximum clearance. In this case that would be .0016"-.003" with a limit of .004". If it is within that specification you could hone the cylinder and put in a new set of rings. If it is OVER that specification you will need to bore the cylinder out to the next biggest oversize and buy a new piston and rings. The reason you take so many measurements is because cylinders can wear at different rates at different spots in the cylinder. The most wear occurs at the top of the cylinder and in the front and back portion of the cylinder. The least wear is at the bottom of the cylinder. Sometimes, you can even see slight hone marks at the bottom of the cylinder, even after many miles. 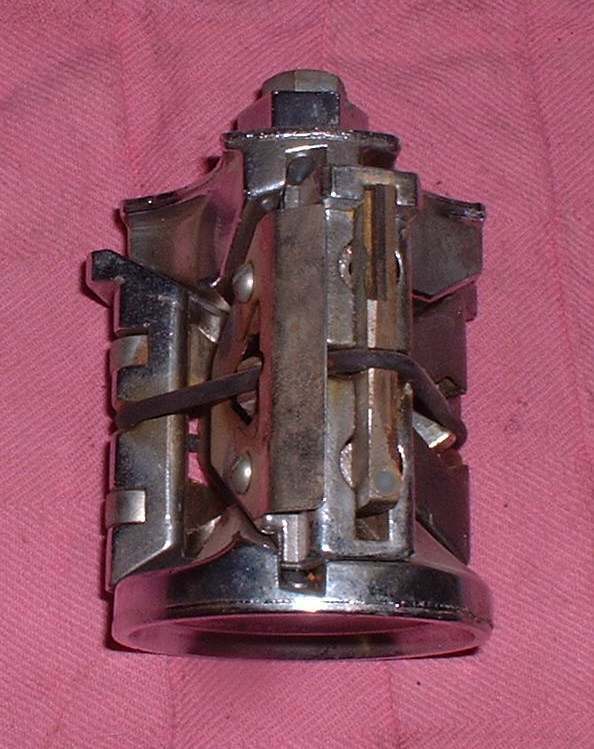 The cylinder wears in a taper and out of round from the top down. Sometimes the wear is so pronounced that there is a ring worn into the cylinder just below the top of the cylinder at the spot where the rings stop. On engines that have their pistons installed from the bottom of the cylinder the ridge does not matter much for disassembly. On engines that have to have their pistons installed from the top of the cylinder there is a problem. The rings tend to catch on that ridge so you have to use a special tool called a Ridge Reamer to cut the ridge out the ridge. Cheap Hones will brake the glaze but not much more. At least if you try to do more you are in for a real fun time. The problem is that you can't hold the taper and out of roundness with any kind of accuracy. This is not to say this can't be done, just that it is very hard to do. I once read of a man in India. He saw a young boy of about twelve years old slowly bore out a cylinder with a rat tail file. He said every day when he walked by this little mechanic shop he saw the boy working on the cylinder with that file. It took about five full days of work before he did it. That kid was a better mechanic then I'll ever be! At least he had more patience then I have. I totally believe the story. It could be done... just not in the USA. This is not to say I haven't bored out some wild and crazy holes. In my wayward youth, for a friend, I once bored out a Briggs and Stratton cylinder, to the next oversize, with a ball hone. It actually worked too! Unfortunately, a motorcycle cylinder requires a bit more precision. Boring with a hone takes a long time. Like several hours. I once honed a cylinder .040" oversize. I held it to the right taper and out of roundness but it took a long, long time. You need a quality hone, I used an Ammco hone. Then you hone a bit and then you measure. Hone a bit and then measure. It takes hours and is very, well, boring! When you are finished you want a nice 45 degree angle cross hatch pattern in the bore. Never hone a cylinder dry. Use lots of oil when honing. Buy the special honing oil. It works much better then plain oil. Honing oil cools the cylinder and hone. It also enhances the cutting effect of the stones. Use a lot of honing oil! The best way to bore a cylinder is to use a boring machine and not a hone. If you do use a hone you must use a high quality one like a Sunnen or an Ammco hone. Hones come in several sizes to fit different cylinder bores. Some of the Ammco hones have several sizes of stones so you can use a standard size hone in a large cylinder bore. The Ammco hones also come in several grit sizes. Coarse (60), fine (220) and super fine (320) for aluminum and plated cylinders. Some top-of-the-line hones use diamond impregnated stones but those are priced a bit out of my price range. I suppose you could try to bore a cylinder with just about any hone but you need to remember this. You MUST hold out of roundness to .001-.002" inch OR less. Taper MUST be less then .001-.002" top to bottom. Shoot for .001" on both! The real trouble comes when the cylinder is already worn oval and tapered. A regular cheap hone will just keep wearing more taper and out of roundness. A good hone is rigidly made and if you are careful, it will pull the cylinder back into round. Start in the lower portion of the cylinder where there is almost no wear and the bore is perfectly round. From there you can work your way on up the cylinder. It is not so hard. It's just time consuming. Like the young boy in India. You have to be patient. You just have to hone a bit and measure, then hone a bit and measure. Continue till you get to the size you desire. The big problem is the time it takes. Removing .010" is not so bad but .020" or .040" takes a long time. Resist the urge to put the hone in a drill press, kick her on high and have at it. Been there, done that. Didn't work so good. Slow, steady, and lots and lots of measurements. That is the way to go. A better way to go is to use a boring machine. The bore job will be more accurate. If the cylinder you are boring is from a two stroke, chamfer or break the edge of the ports with a file so the rings do not get caught on edges. A ball hone works great for this. Also remember to check the power valve. If it extends into the cylinder after boring it will have to be ground down so no part of it can touch the piston. You can hone plated cylinders but only just a bit. All you want is to make a cross hatch pattern to help the rings seat. You may need to buy special stones depending on the kind of plating of the cylinder. Check with the manufacturer to be sure. When you are finished, clean the cylinder with clean solvent and then wash it in warm soapy water. Then take a clean rag and put some fresh oil on it. Now wipe the newly honed cylinder down with it. If you see any dirt on the rag rewash the cylinder and wipe it down again. Do this until the rag comes up clean. When all is said and done the best way is this. Measure the cylinder and piston. If the clearance is within specification, hone the cylinder a bit, put in new rings and drive on. If you must bore for an oversize piston, get the piston, get the correct clearance, take both and the cylinder to a machine shop that bores cylinders and let them bore it. This is the best and cheapest way to get the job done right.